I made a dessert for a private event this past week that I haven't made in years—a simple tart of ripe summer peaches and blueberries. One of the consequences of teaching cooking classes and developing recipes for a living is that I am always working on something new. Old favorites sometimes fall out of rotation. 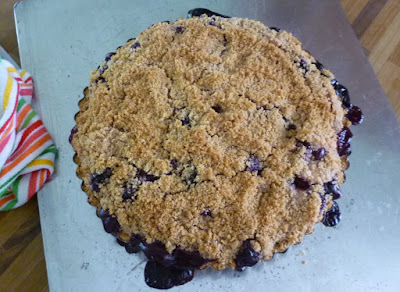 This week as I sliced and plated the warm tart...and nibbled on the little bit of juicy fruit—along with the crumbs of tender crust and sandy streusel—left in the empty pan, I remembered how much I like this tart...and wished I had just a little more to nibble on. So instead of settling for a few crumbs...and just wishing...I went home and made another tart. It is an easy tart to make. For those who avoid making pie crust, don't worry. This tart has a sweet cookie crust that anyone can make. and tossing them with blueberries, flour and sugar. 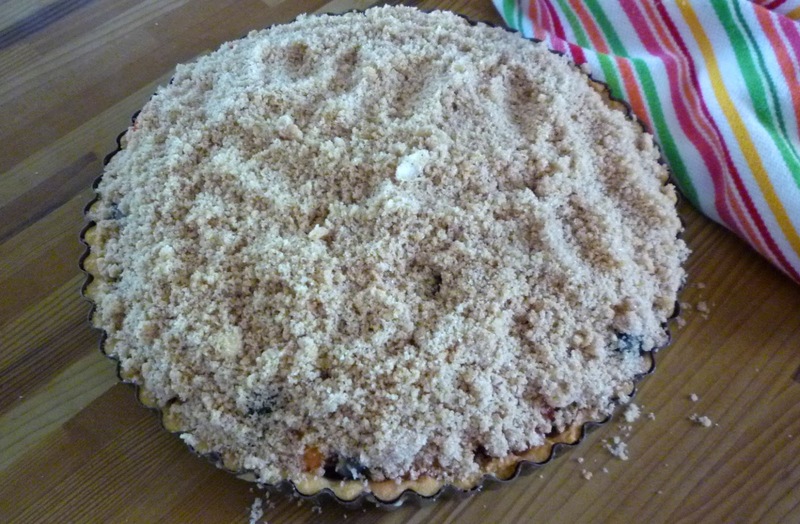 The amount of sugar is less than the typical American-style summer fruit pie, but you really don't need that much. 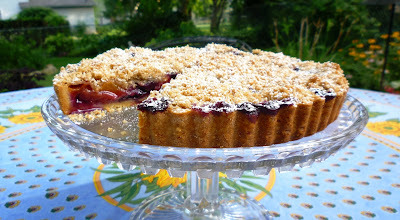 The crust and streusel are both sweet....and the fruit itself should be ripe and sweet. Without a lot of extra sugar, the delicious flavor of the fresh fruit is allowed to shine. This tart is best served within a few hours of baking. It will still be delicious on the second day, but the crust will have begun to absorb some of the fruit juices...making it a bit soft. 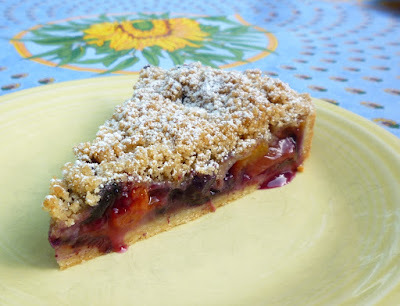 Served on the same day...while still slightly warm from the oven (which is when I was nibbling on the remains at my event), the fruit will still be soft and juicy, and the crust and streusel tenderly crunchy.... In short, irresistible. It is unlikely that leftovers will be an issue (but if they are, I'm sure you will know what to do). Cut a small slit in the skin on the bottom of each peach. Place the peaches in a bowl and pour boiling water over them. Let stand for a minute to loosen the skins; transfer the peaches to a towel. Peel, halve, pit and slice the peaches 1/4-inch thick. 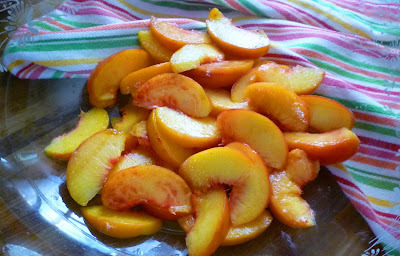 You should have about 3 cups sliced peaches. Place the peaches in a large bowl along with the blueberries. Combine all of the dry ingredients in a small bowl. Add the dry ingredients to the fruit and toss until the peach juices have moistened the dry ingredients. and top with the streusel—the fruit should be fully covered. Bake until the streusel is golden brown and the fruit is bubbling throughout the tart—about an hour to an hour and 15 minutes. Let cool an hour or two before serving. Serve with whipped cream or vanilla ice cream. 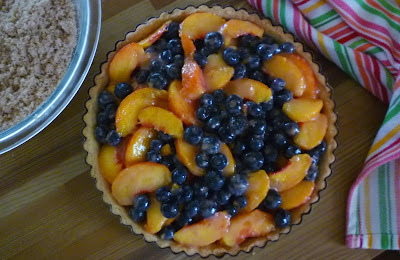 Note: The tart shell will be quite full of fruit and will most likely bubble over a little bit as it bakes. Setting the shell on a baking sheet will prevent the juices from ending up on the oven floor. On a lightly floured board (or between 2 sheets of plastic wrap), roll about 2/3 of the dough out to a thickness of 1/8- to 3/16-inch (the remaining dough may be frozen for another use...or rolled, cut and baked into sugar cookies—see note). 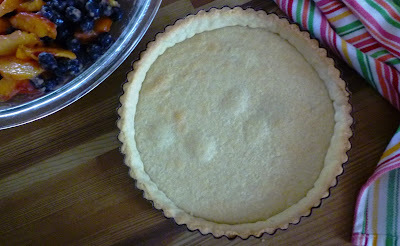 Brush off the excess flour and transfer the dough to a greased tart pan. Ease the dough into the pan being careful not to stretch it and pressing it against the sides of the tart pan. Use your hands to gently cut the dough flush with the upper rim of the tart pan. Well, everything about this tart draws me in! Thank you, Paige. I will let you know how mine goes when I make it. Really lovely! Thank you Bonnie! I think you will love this tart!